Scarguard mastered the art of harnessing that power. Scar treatments used by plastic surgeons MUST WORK! Their reputation depends on it. 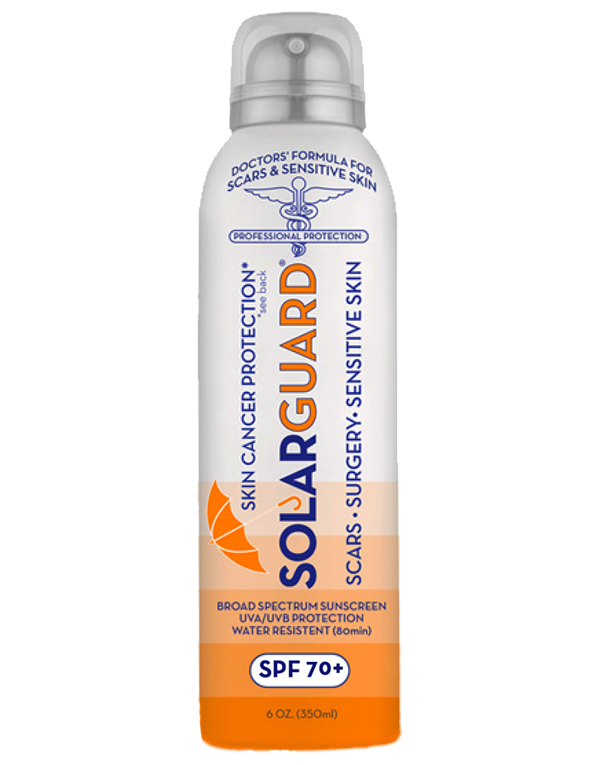 Johnson & Johnson’s Plastic Surgery division, Mentor Corp. picked Scarguard as THE ONLY scar product to sell to plastic surgeons to make their work look better. Clinical trials proved it WORKS. Injury? Surgery? Prevent new scars and shrink old scars like plastic surgeons. Get Scarguard. The #1 choice of plastic surgeons worldwide! Stitches? Surgery? Injury? Burn? Medical research shows that Silicone, Cortisone and Vitamin E are extremely powerful scar fighters if used properly. 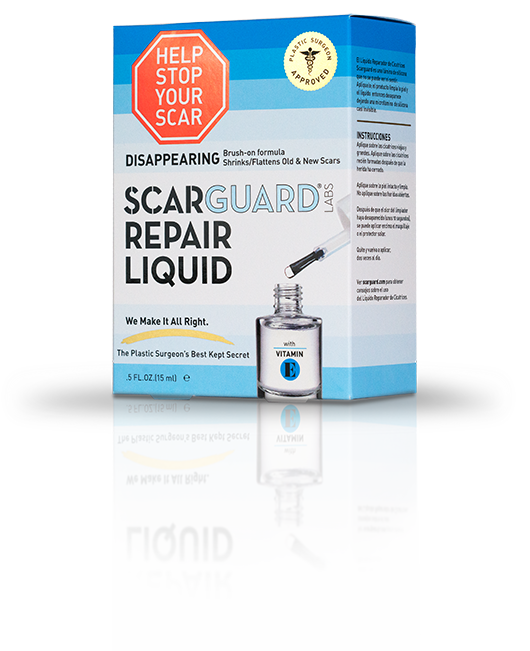 Scarguard… globally patented and medically proven, is the only scar treatment containing all three. 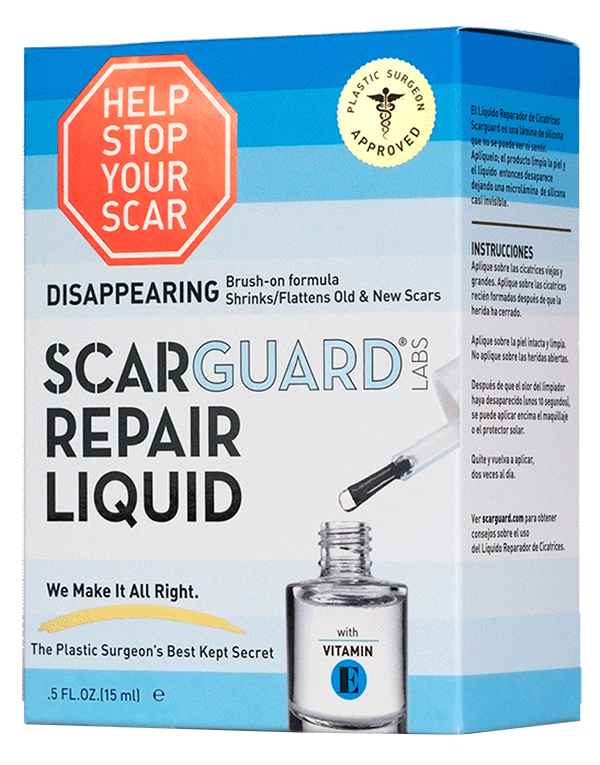 Scarguard is the #1 scar treatment of plastic surgeons worldwide and you can get it today without a prescription! Scarguard is a liquid that brushes on and quickly forms an invisible protective layer, delivering all of these treatments. Twice a day, simply lift it off with a piece of scotch tape and reapply. It has been proven to decrease scar tissue tremendously if used after an injury has closed. It will also work on old scar tissue if it is thick and raised! Get some now and watch your scars shrink and fade! Dark scars, age spots, liver spots, freckles and melasma can be challenging. 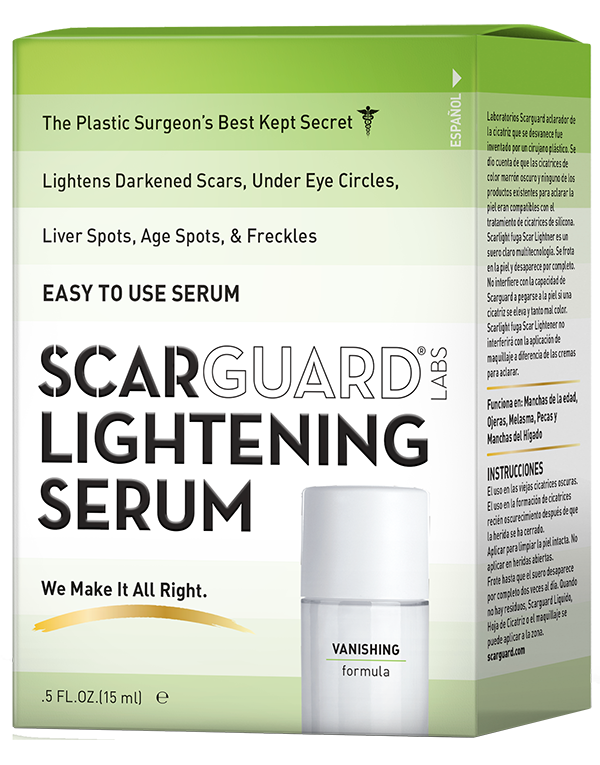 ScarLight Lightning Serum is up to the challenge. A revolutionary, disappearing serum, it can be used along with Scarguard on a scar, or under makeup invisibly. It is powerful and multi-technology. You had a cosmetic injection to look better. Now you are black and blue! 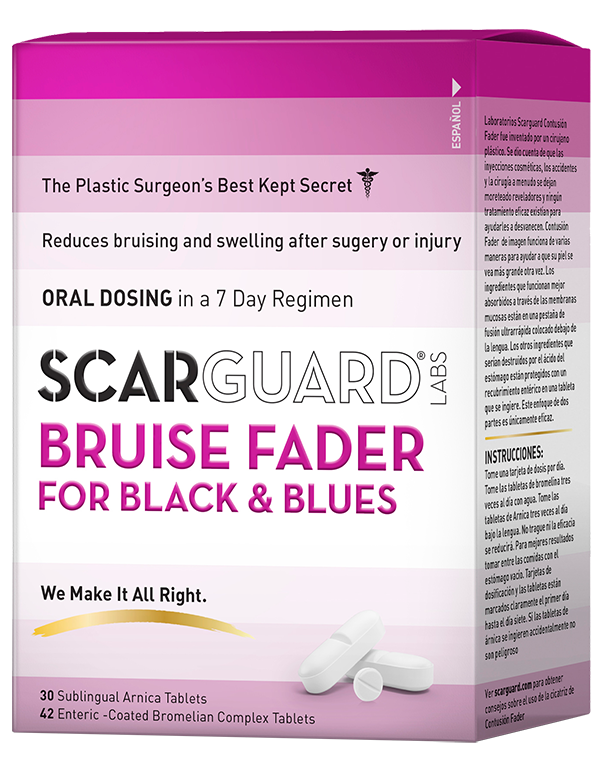 Whatever you are black and blue came from, BruiseGuard bruise fader can work miracles. Helping your natural healing powers, this patented system gets you back out and about looking great. Take before your injections or once the bruising has occurred. While the power of the cortisone in our Scarguard Repair Liquid is extremely effective, it may not be desired for young children or while breast-feeding. 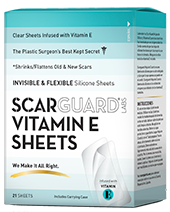 Our Silicone Scar Sheets are infused with Vitamin E, thin and unobtrusive. This is a great, effective solution for managing both old and newly forming scars.